I love evenings in the summer - there is something so relaxed and memorable about them. And I love getting a bit dressed up though still keeping it easy and comfortable like with this Asos dress. I could see this worn with lace up sandals and a hat for a more casual look, or heels and a clutch like I wore for a more polished feel. 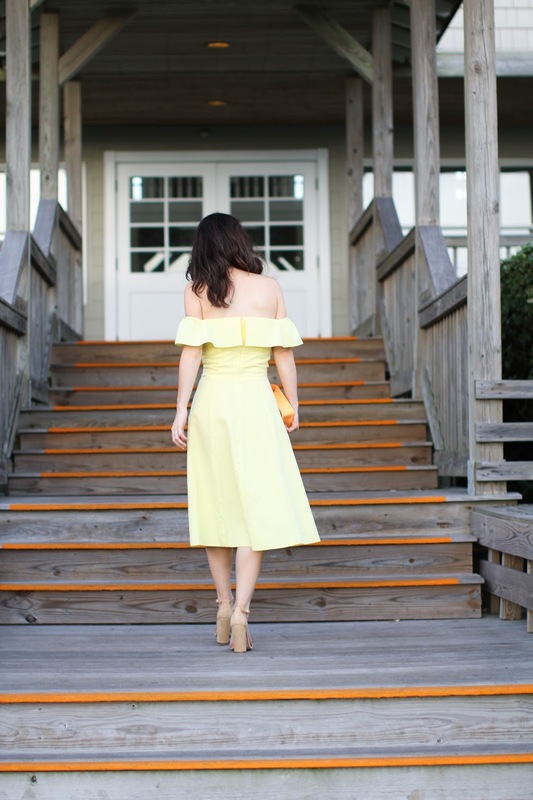 Some off the shoulder styles can be fussy and require constant readjusting, but this dress stays up so well! I think it is the fitted bodice that helps create a more structured frame for the top, but either way it is a pleasure to wear. And while these sandals are higher than I normally wear, the chunkier heel makes them less painful. I picked them up because I thought they would be a great year round (except for super cold weather) sandal that would look great with any and everything in my closet. I know the lightweight sweater, jeans and sandals look is a bit controversial, but personally I love it. So I'm excited to style them with some fall and early spring outfits. 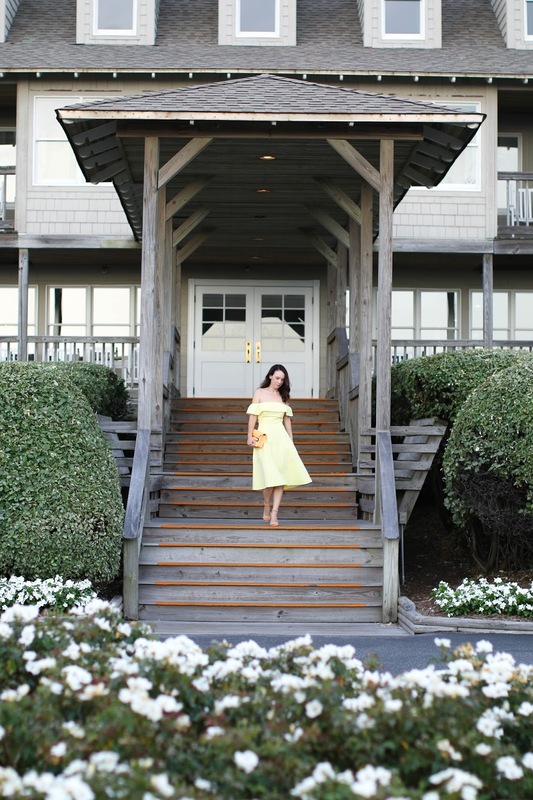 Last week we headed down to the Sanderling Resort in Duck, North Carolina and had a great time relaxing by the beach and eating some insanely fresh seafood while we were there. The whole style of the Sanderling is very beachy and laid back as you can see from above, with so many gorgeous flowers all around the grounds. Across the street from the actual hotel is a restaurant and racquet club with stunning views from the docks. We walked over there for a bit to take pictures before dinner, though I have to be honest - the humidity made it so difficult after 20 or 30 minutes. LOL I caught myself complaining about the weather and had to stop and revisit some blog pictures taken in January and February remembering the blistering cold temps and how much worse that is. I'll take the heat any day over that.